Let Holiness flow from your device! Read, Listen, and Understand the 99 Names of Allah (Asma Ul Husna) on your Android! Bring these Holy Names of Allah closer to your heart while immersing yourself in a beautiful user interface that is easy to use. You will be able to experience the 99 Names of Allah Asma ul Husna with beautiful calligraphy, English translation, and pronunciation. This free Islamic app will allow you to increase your blessings through the miraculous power of the 99 Allah Names. It has been mentioned in Hadith (Ahadiths) that whoever recites and remembers the names of Allah will have forgiveness in the Hereafter. 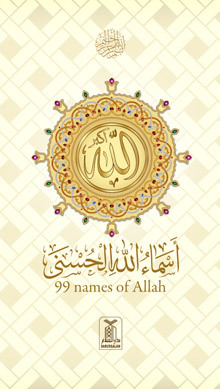 With these 99 Names of Allah you can be sure to easily recall Allah names with ease. Just play it and start listening, it’s that simple! blessed you and your Family. Thank you! May Allah appreciate your favors in Islamic way!